I like to think somewhere in the multiverse that there’s a parallel (likely more than one) where Norwood fields a team in the National Football League. This league sprouted from the Australian National Football Council which, acting collectively, was able to resist the rapacious advances of the VFL and establish a national league on fair terms. All the big hitters from around the country are involved: Norwood and Port Adelaide; East Fremantle and East Perth (did I get that right? ); your usual suspects from Victoria; and maybe even a Tasmanian team, so wacky is my parallel. The game has still grown due to relocation of Victorian clubs to New South Wales and Queensland and all clubs grow and recruit players from inside their region. I am truly engaged in the league, such is my utopia. People know the Parade (Norwood’s home ground) in that other universe. But let’s leave the realm of theoretical physics / cosmology – there’s footy on. As regular visitors to the venue we make our way down early to grab our sneaky park and catch some of the SANFL Women’s from the grand old Edwin T Smith Stand (opened in 1929). Top of the table Norwood, disappointingly, are thoroughly outclassed in the midfield and around the ground by a hungrier Glenelg. In the end an 18 point margin flatters the Redlegs. In the meantime, as the crowd builds up in the shadier parts of the ground on a 30 degree day, the lass gets to go on the ground for another footy clinic. She steadfastly insists on kicking and handballing left footed/handed, despite writing with her right. I think I’ve got a much better chance of making her a two sided player than her brother who has inherited his father’s profound right sidedness. Following the clinic and with half an hour to go before game time, we pivot round to the northern end and set up right behind the goals to be closer to the bouncy castle. The crowd is building nicely and this is the most people I’ve seen at Norwood Oval in a very long time. The significant numbers of young families (your average SANFL crowd tends to be of thinner and greyer hair) add an exuberance to proceedings that will have the AFL marketing department dreaming of Scrooge McDuck-like quantities of money in which to swim. The teams set up for the start of play and Chelsea Randall goes to Tayla Harris in Brisbane’s forward line – a literal marquee match-up. As the game gets underway, despite giving away a significant height and size advantage, Randall soon gets on top of Harris and stays there, leaping over her at every contest, throwing herself into tackles and seeking to influence the game around her. Nonetheless, Brisbane start the cleaner, pressuring Adelaide into uncharacteristic turnovers out of defence and soon get the first through Emily Bates. Adelaide fight back through weight of possession and even things up by quarter time through a string of play involving Perkins, Phillips and an unmarked Sally Riley in the goalsquare. 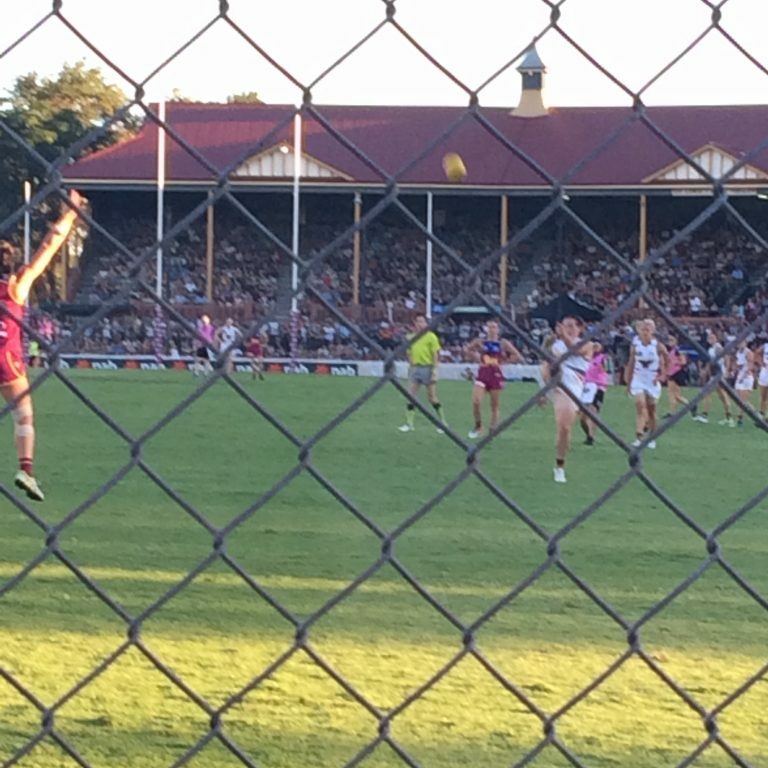 Sarah Perkins kicking a goal as seen through the very un-AFL like fence. The pattern continues – the Crows have the weight of possession but Brisbane’s implied pressure has them disposing of the footy just that fraction of a second too early / with too little consideration. Fast forward to the closing minutes of the third quarter and the lights have replaced the sun. Abbey Holmes wins a free kick, a 50 and goals to the southern end and the Crows look to take an eight point lead into the last quarter (and despite the free kick count should have received another free for being dumped straight after). However, in the dying seconds Brisbane rush the ball forward and Kate Lutkins converts after the siren. The Crows still lead but it feels like a subtle momentum change. The fourth quarter is everything you can hope for in a tough contest of footy. The two fittest teams in the competition put everything in seeking to link and run the ball forward. Brisbane capitalise on another defensive error from the Crows and hit the lead through Kate McCarthy. The Crows push forward, attack after attack but the ball just won’t quite sit right. The Crows may have the umpires but the Lions seem to have the bounce. Finally Phillips gets the ball deep inside the 50 for her already customary match-winning moment. She rushes it around the body and narrowly misses. Minutes later the entirely inaudible siren sounds as the Crows try one last forward entry. Joyous Lions celebrate a well-earned victory and take the mantle of flag favourites in the process. But what a contest – a national audience has just seen Norwood Oval at its finest. A gripping duel in front of a full and vital crowd. As we make our way back through darkened, but safely gentrified, suburban streets I consider that the most enjoyable things about the AFLW are those that are likely most impermanent. The pure joy with which the women have been competing will soon be replaced by the weight of expectation – perhaps we even saw a bit of that tonight. This first generation of AFL women footballers that are teachers and nutritionists; satellite engineers and naval officers will soon be replaced by full-time footballers. It’s an important step but how great is it to have sporting role models for our kids that have life experience beyond the game from which to speak? The lass meeting Chelsea Randall. The first generation of AFLW players’ life experience makes for great role models. Over 12,000 in Norwood Oval – glorious but stretching comparatively ancient drinking, feeding and toileting facilities to breaking point. None of these things are sustainable but we can enjoy them while they exist. 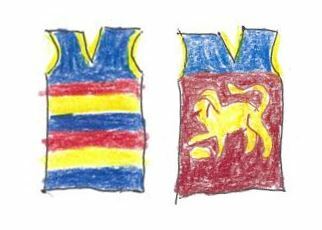 A writer suggested during the week that the interest in AFLW is a classic case of the emperor’s new clothes because he does not believe the quality of football matches the hype (apparently his TV lacks an off switch). I beg to differ – it’s not that the emperor has no clothes, it’s that he doesn’t appreciate the transient beauty of what he’s wearing. Love the photo of your daughter with Chelsea. 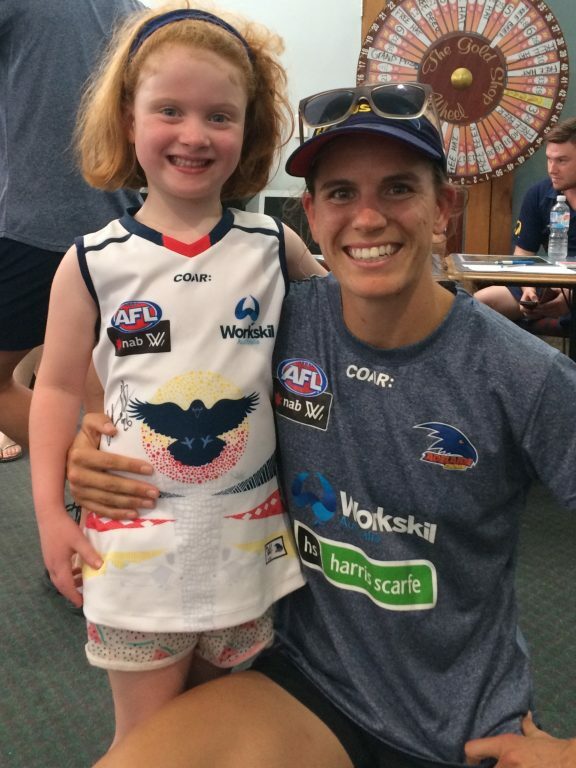 Who knows in 18 yrs time it might be your daughter playing for the Crows and having her picture taken with a young fan. A champion team will always beat a team of marquee players. I think your feelings about Norwood reflect my reaction to having games back at Princes Park. Just call us nostalgic. A syndrome of middle age. I comment in my piece about the effect of scheduling AFLW games as preludes to mens’ practice matches. I note here, this stand alone game drew easily the largest crowd of the weekend. I presume the AFL are noting this. Thanks for the read and the comments. Yeah, it’s our favourite photo this year, Andrew. The lass attended a clinic at Norwood a few weeks ago where it was too hot to actually play footy so they had a talk from a few of the players instead. Hearing the life stories and varied career experiences of the players was really interesting and the lass immediately identified with Chelsea when she met her (she has career experience in engaging kids in remote communities through sport). Think it was two champion teams on display, Kevmak – Lions just got over the line on the day. Don’t think it’s reasonable or accurate to describe the Crows as a “team of marquee players”. Haha, I’ll await the lawyer’s letter John. Yep, very much a middle age syndrome. The question will be how the AFL manages this in coming years. Is there value in upgrading stadia like PP and the Parade for crowds of 10-20k? I’m not sure. Hopefully this is the last year AFLW games are curtain raisers – they are clearly more meaningful to people. Saturday night had 262,000 TV viewers – over 200,000 on FTA. Many more than any of the JLT games and more people watched it on Fox than any of the Super Rugby games. AFL has a product here that they need to treat seriously – the potential $ should create sufficient incentive. Hi Dave, love the article and the photo says it all. I see myself in your daughters face. How magnificent that girls (and boys) are meeting strong, fit, courageous and skilled women, and can dream of being like them? Dips wrote an article first round about being careful what you wish for…that these feelings about the women’s game and the interesting story of the women, the use of the grounds and the feel of community, will change once they are fully professional. It is true, it will change. If it changes and we have 18 teams of women who are paid equally, draw crowds, and help us all see many women who are skillful and athletic, I can take that. And I think you will find that the players will take that too. They want to be footballers. That’s it. I will think of the above photo with warmth forever. It is so lovely, the expression on both their faces. Thanks Yvette. I identify strongly with Dips’s piece, one of the reasons why I’m seeking to make the most of the early iterations of AFLW. Access to players, as above, will never be as available for the kids as it is right now. I’m hoping it is one the lass will look back on with fondness regardless of where her journey takes her.